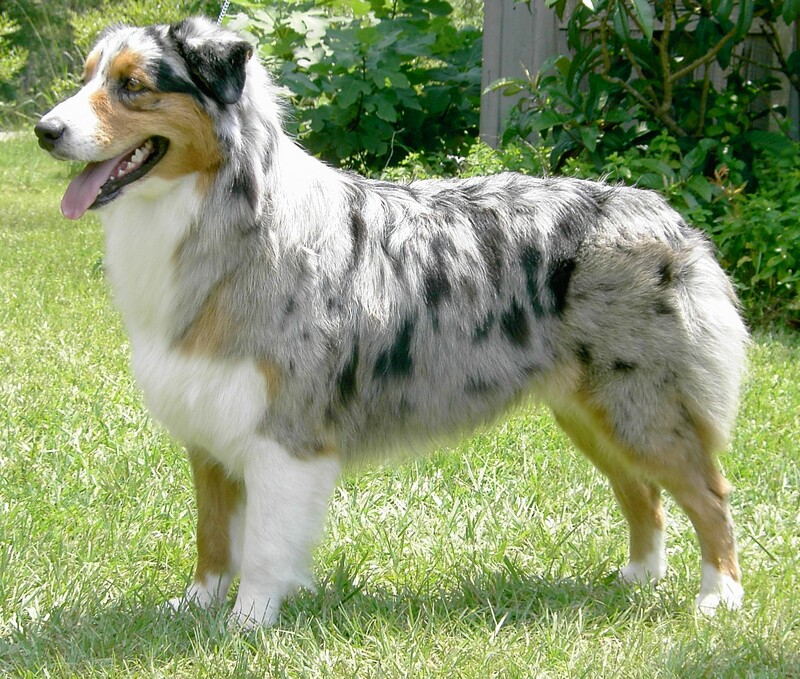 Australian Shepherd is a herding dog breed, developed in the western United States. 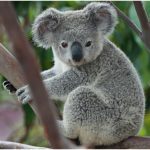 There is a misconception about its origin, but this breed was not developed in Australia. In western United States, ranchers used to herd Australian sheep with these breed of dog. 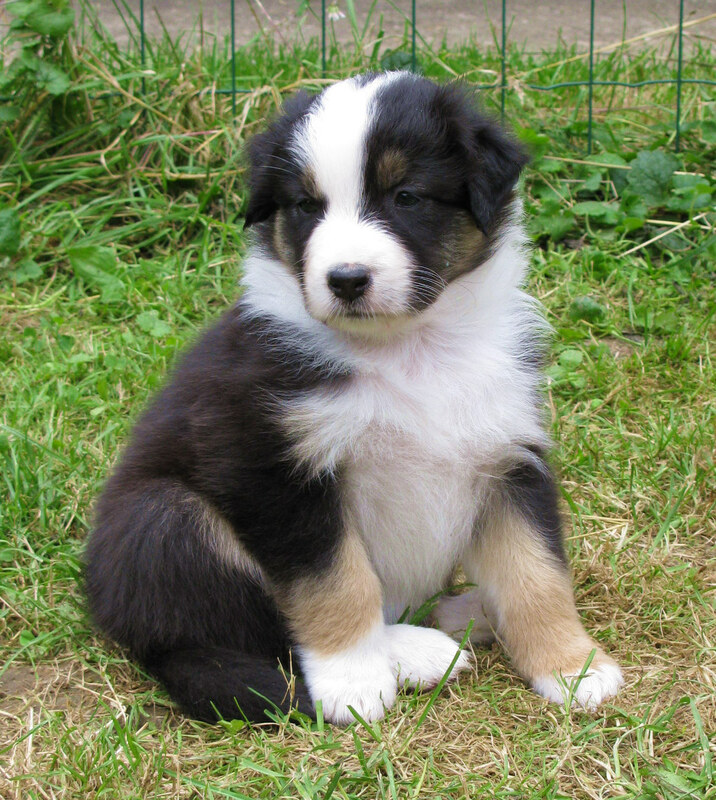 Thus they acquire the name ‘Australian Shepherd’, but commonly they are called ‘Aussie’. 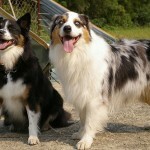 Aussies have similarities with English shepherd and Border collies in appearance. Their popularity has increased after the First World War because of their use in rodeos, shows and television movies. For their versatility and trainability they were popular among the stockmen and later, earned recognition in other roles because of their skills in obedience. As search and rescue dogs, service dogs and disaster dogs, Aussies always highly valued. Australian Shepherds are medium sized, well balanced, rustic dogs with slightly longer body than its height at the withers. Weight varies but can be anywhere from 40 to 90 pounds. 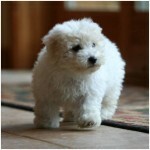 Average height of this breed is between 17 to 26 inches. 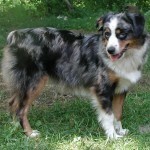 Several coat colors are found among the Aussies including red, black, blue and red merle, and grey with or without tan points and or white spots. 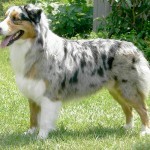 Usually four distinct coat color combination can be found in most Australian shepherds Black, Blue merle, Red merle and Red solid/liver. The combinations can be with or without tan points and white markings. Solid black, red, blue and red merles are also commonly found. Colors of nose, eye rims and lips are also different. Nose, eye rims and lips are black in case of Black and Blue merle dogs. But, in solid red and red merles, nose and lips are brown or liver. Variations in the eye colors have earned this breed the nickname ‘Ghost-eyed dog’. Different shades of blue and brown can be found. A lot of these dogs have two different colored eyes. 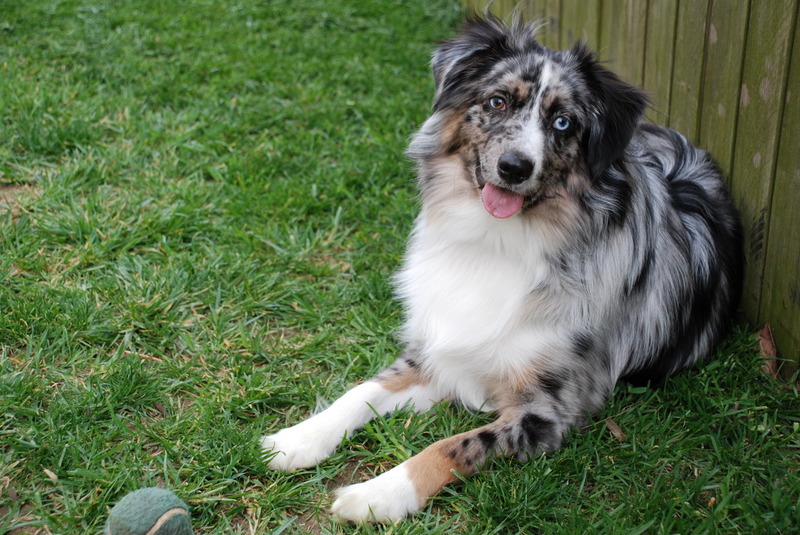 Bi-colored eyes, which are also known as split eyes are also common in Australian shepherd. Split eyes are commonly found in dogs with merle coloration. 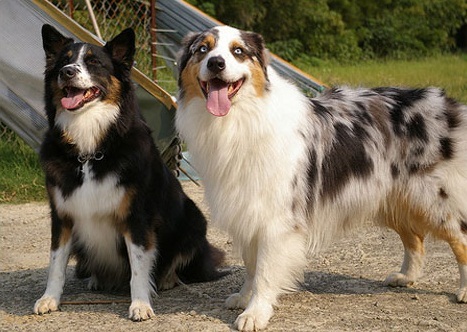 Among the shades, brown is common in black Aussies whereas red Aussies generally shows amber colored eyes despite the fact that they have blue-eyed gene. Most of them have naturally bobbed tails but long tails and partially bobbed tails are also common. Docking of long tails in Aussie pups is popularly practiced in United States and Canada. 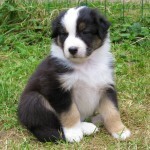 Australian Shepherd has a medium size head with triangular ears set high at the side of their head. They have a weather resistant, straight to slightly wavy coat of moderate length. They also have an undercoat but its quantity depends on the climate. 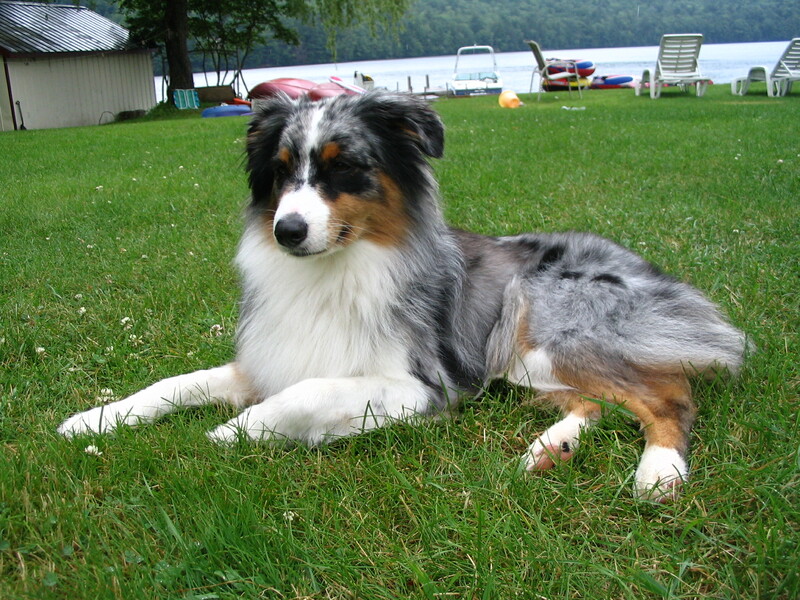 Aussies have moderately feathered forelegs with pronounced mane and frill in male dogs. 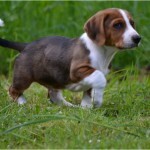 They have deep chest with straight, perpendicular front legs. Back dewclaws are usually removed but front dewclaws are usually found. 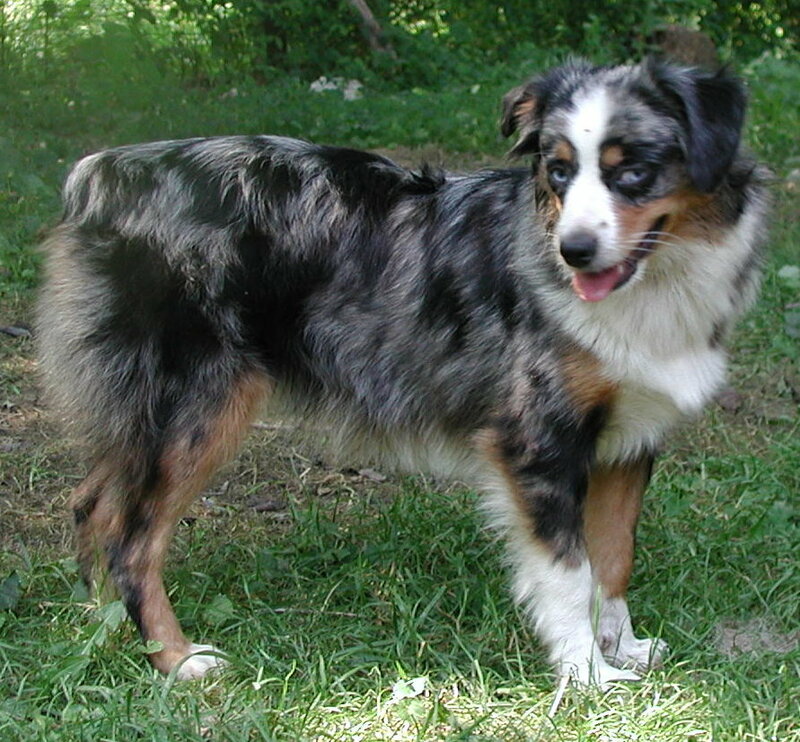 Dietary habit of Australian Shepherd is similar with other dog breeds. No special diet is required. Puberty starts at 6-7 months of age. Gestation length is 9 weeks. 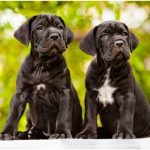 Litter size is usually 6-9 puppies, average 7. 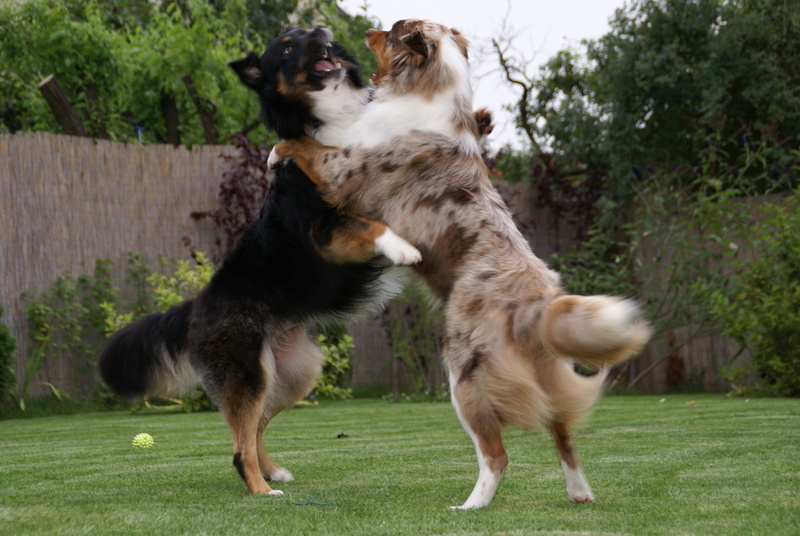 Australian shepherds are not usually dangerous but lack of exercise can make them extremely destructive. They are energetic and it should be directed in a positive way. The need space to run and exercise and because of that they thrive for rural atmosphere. 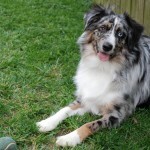 As a working dog, Australian Shepherds have lots of energy and they always thrive for work. They are good at common dog sports like fly ball and Frisbees. Great deal of attention is required to these dogs because of their versatility and constant need of exercise. They also love working whether it is a job or simple sport. They are always ready to be engaged in any types of physical and mental activity. Aussies can ‘smile’ by baring their teeth, which is a rare quality. They are highly spirited, keen the learn tricks and focused. 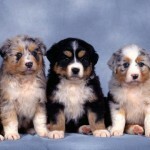 Average life span of an Australian Shepherd is around 11-13 years. Aussies also have characteristic stride where front and back legs cross over like an appearance of ‘on the edge’ speed. Moreover, to deal with the angry cattle they often use a ‘pounce’ position to avoid kicking. 7. The oldest Australian Shepherd dog so far is ‘Pockets’, lived 15 years and 5 months. 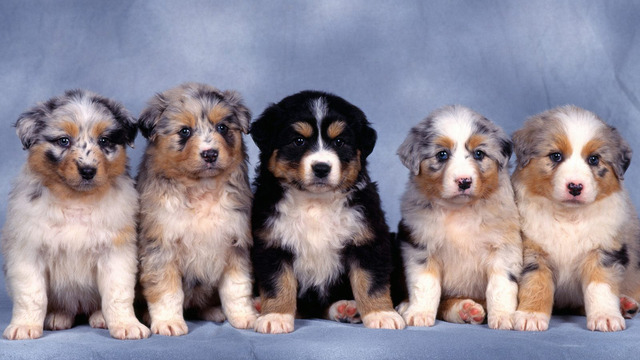 Australian Shepherds living in western United States since 1800. Earlier history suggests that in the Pyrenees Mountains this breed was developed first. Later it moved in both United States and Australia with Basque shepherds and fine Merino sheep during the early days of colonization. Today they are found in most countries of the world. 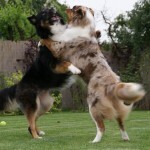 Australian Shepherds are kind, loving and loyal to their owners. They often showed reserved and cautious guarding behaviors, but never show obsessive barking behavior. During the development, dogs of this breed were used to protect the property by giving warnings about neighborhood activity. They are intelligent, quick learners and playful. They might invent their own games or jobs if they are neglected or unexercised. 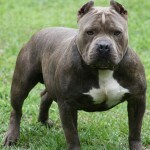 They have a strong desire to stay around their owners and because of this tendency they are often called ‘Velcro Dogs’. They are also a thoughtful breed which increases their adaptability to various situations and makes them all around worker. They have also shown great performance as watchdog. They are easy going and excellent with children because of their love of games and exercise. 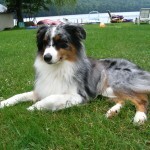 Aussies are very attentive to their owners and can catch easily what their owner wants them to do. They are aggressive during work but with their owner, they are very gentle and friendly. They need daily exercise to keep them mentally and physically fit. Serious behavioral problems are often associated with bored Australian shepherds. Because of their strong hips and legs, they can jump as high as 4 ft.